This scheme is based on 6 lessons of 50 minutes each day, taught in pairs before morning break, between break and lunch and in the afternoon. The schedule cycles over one week with every week being the same. Creative option choices at the end of year 8 when students practise choosing subjects. They will choose 3 from typically 10 to 12 subjects which they study for the first half of year 9. This gives them an opportunity to get a feel for the options process and prepares them for making their GCSE choices, late in the autumn term of year 9. These ‘practice options’ do not restrict in any way their choices for GCSE. GCSE option choices which will begin after spring half-term of year 9, giving a full two-and-a-half-year GCSE course, allows time to cover the course content of linear GCSE courses. Students choose 4 subjects and the only restriction is that they must choose one of the English Baccalaureate subjects. These include Humanities, Languages and Sciences which currently offer Geography, History, French, Spanish, Computer Science and Triple Science. The other 3 option choices are free, but students are encouraged to follow a broad and balanced curriculum. Advanced Level choices in which students select 3 choices from the 5 option blocks. The only restriction is that students must meet the entry requirements for all three subjects and to study Advanced Level courses in general, which are published in the Sixth Form prospectus each year. 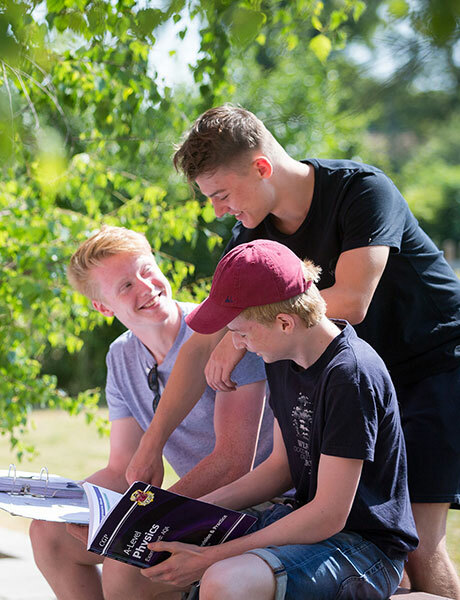 The school also offers a one-year bridging course in year 12, to meet the needs of those students who wish to study Advanced Level but have fallen short of the entry requirements. This course consists of 5 Level 2 (GCSE or BTEC) courses including English and Maths. The other 3 courses will not have been offered in years 10 and 11.